Saturday, March 17, 1838.Springfield, IL. In Finley v. Finley and Winn v. Winn, two divorce cases, Stuart & Lincoln obtain divorces for complainants, Andrew Finley and John Winn respectively. The court rules in favor of Stuart & Lincoln's clients in three chancery cases: Hickman v. Braucher et ux., Miller v. Chrisman et al., and Anderson, Bell & Co. v. Garrett et ux. The court orders Stuart & Lincoln's client, Manley F. Cannan, to give security for costs in Cannan v. Kenney.Record. 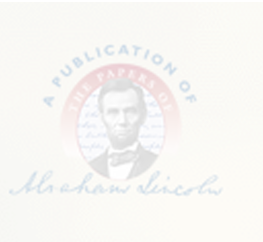 Lincoln writes and files court decrees in Miller v. Chrisman et al. and Wilson v. Simpson et al., and the affidavit of William Goodacre in Goodacre v. Simpson.Herndon-Weik Collection, Library of Congress, Washington, DC.